Native to the tropical regions of Central and South America, the peace lily (Spathiphyllum) is grown as a houseplant for its attractive foliage and unusual blooms. With hundreds of species, this plant grows to heights of 1 to 4 feet depending on the cultivar. Foliage varies from deep green to variegated varieties. 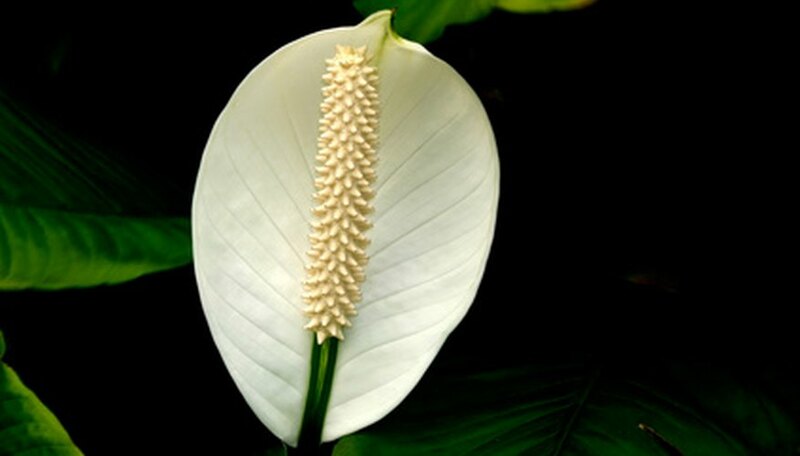 Blooms held above the foliage feature a showy white or pink spathe or bract that encloses the actual flower. The bract folds gracefully over the flower creating the illusion of a hood. This relatively carefree houseplant requires weekly watering. Lack of water results in brown or dying leaves. Remove brown leaves by hand. Grasp the stem of the leaf and follow it back to the main stem of the plant. Gently pull the leaf downward to detach. Dead leaves typically remove easily, but if the stem resists your tug, use scissors. Clip leaf stems as close the main stem as possible with a pair of sharp scissors. Trim away dried brown leaves along the stem. Use care not to cut the main stem. Check soil for dryness, as this is often the cause of dead or dying leaves. Fill a bucket or pail with water and allow to set until the water reaches room temperature. Place the plant pot into the water so the entire pot is covered and allow to soak to thoroughly saturate the soil. Bubbles rising to the surface indicate that the soil is overly dry and air is escaping as water replaces pockets of air. Remove from water when bubbles cease and allow excess water to drip from the pot. Resume normal care, watering the plant thoroughly until water runs free of the bottom the pot once or twice a week. Water peace lily with water at room temperature. Peace lily grows in low light, but requires moderate light to bloom. Fertilize sparingly. Use a balanced fertilizer every two to three months. Avoid direct sunlight. Peace lily leaves burn easily. Peace lily is toxic and should be kept out of the reach of small children and pets.